Marilyn Monroe had a glamorous and exciting existance, but Norma Jeane had a lonely, tragic life.There are many opinions about the details of her life and many questions surrounding her death. I don’t know the truthful answers. In this brief history, compiled from many sources, I try to present the indisputable facts without any editorial comments. You must form your own opinions based on your own judgement. Marilyn Monroe was born at 9:30 AM on June 1st, 1926, in the Los Angeles General Hospital registered under the name of Norma Jeane Mortenson. Her mother, Gladys Monroe, gave her to a foster family where she lived until she was 7. Then her mother, following her grandfather’s suicide, reclaimed her and brought her back. Soon thereafter her mother’s friend, Grace McKee, had Gladys declared insane and commited to a psychiatric hospital, and took custody of Norma Jeane. Then Grace met Ervin Silliman Goddard and married him. Goddard brought one of his 3 daughters back to live with them, and then Grace sent Norma Jeane away at the age of 9 to the Los Angeles Orphans Home where she became occupant number 3463 for several years. Two years later Grace brought Norma Jeane home but Goddard tried to molest her, and so she went to live with her mother’s brother’s mother, Olive Brunings. Just after Norma Jeane’s 12th birthday she was assaulted by one of Olive’s sons and went to live with Grace McKee’s aunt, Ana Lower. Several years later Ana developed health problems and Norma Jeane went back to the Goddards where she met a neighbor’s son, Jim Dougherty. Right after her 16th birthday, Norma Jeane married him. In 1944 Jim was called to military service and she went to live with her mother-in-law. Norma Jeane got a job at an airplane factory. The Army sent a photographer (David Connover) to take pictures of women helping with the war effort. The photographer was impressed by Norma Jeane and suggested she apply for a modeling position at the Blue Book model agency. By 1946 she was on 33 magazine covers and was posing for top photographers. Grace McKee arranged a divorce for her. In July 1946 Norma Jeane did a screen test at Twentieth-Century Fox and got a contract which she signed using the name Marilyn Monroe. She got a role in Scudda-Hoo! Scudda-Hay! and her only words were ‘Hi Rad!’ he alszo got a bit part in Dangerous Years. Twentieth-Century Fox did not renew her contract in 1947. She then got a contract with Columbia but didn’t get any parts. Then she had an affair with Johnny Hyde, executive vice-president of the William Morris Agency, and he got her a cameo in the Marx Brothers movie Love Happy and small roles in The Asphalt Jungle and All About Eve. 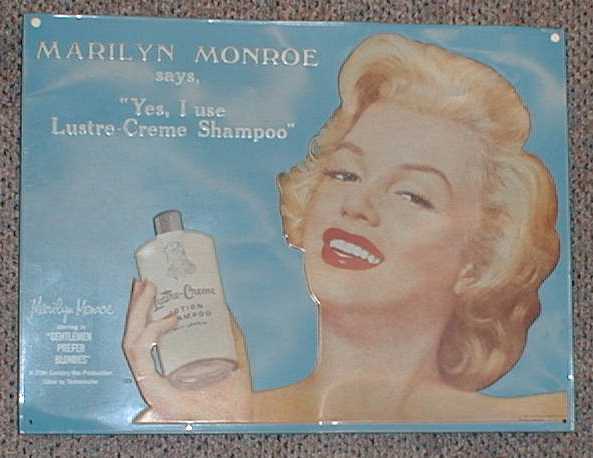 When Hyde died in 1950, Marilyn went to Famous Artists who soon got her a seven-year contract with Fox. By the end of 1951 Marilyn was receiving 2000 – 3000 fan mail letters per week and because of her popularity the studio gave her the starring role in Don’t Bother To Knock and Monkey Business. In 1952 she began an affair with baseball great Joe diMaggio. In June she got a co-star role in Gentlemen Prefer Blondes. On January 14th, 1954 she married Joe diMaggio in San Fransisco. After their honeymoon Marilyn started work on The Seven Year Itch but she was frequently late and unproductive on the set. She also had problems with her marriage and got divorced on October 27th, 1954. At Christmas, Marilyn moved into a New York City apartment and enrolled at Lee Strasberg’s Actors’ Studio. She also began her relationship with playwright Arthur Miller around this time. On June 1st, 1955 The Seven Year Itch premiered and became the biggest movie of the summer. On June 29th, 1956 she married Arthur Miller. On July 1st, 1956 they had another, Jewish, wedding ceremony. Then they went to England, where she began work on Marilyn Monroe Productions’ first independant movie,The Prince and the Showgirl. Marilyn went back to Hollywood to work on the movie Bus Stop. Marilyn had more problems on the movie set and was taking large doses of sleeping pills. After Bus Stop she started work on the movie Some Like It Hot and although her problems continued, she did finish it, and it became the biggest hit of 1959. In July of 1960 Marilyn went to Nevada to film The Misfits. The movie was a disappointment and Marilyn was depressed. On January 20th, 1961, the day of President Kennedy’s inauguration, she divorced Arthur Miller. Marilyn’s therapist had her commited to the New York Hospital for several days. Marilyn smuggled a note out to Joe diMaggio who came from Florida the next evening and got her released. She was with him again until April 1961, when she returned to Los Angeles to start work on the movie Something’s Got To Give but after the first day she stayed at home sick in bed. On May 19th, 1961, she went to Madison Square Garden and sang Happy Birthday, Mr. President to President Kennedy, and then went back to L.A. and the movie set. She almost overdosed on drugs and Joe diMaggio came to her rescue again. They decided to remarry and set the date for August 8th, 1962 but on the evening of August 4th, Marilyn died. There was no suicide note, and she was found naked in bed with no signs of violence, according to the police investigation. Although there are many different rumors and conspiracy theories surrounding her death, they are all unproved, and we can only guess or believe whatever we want to believe about it. All we can agree on, probably, is that Marilyn was a very beautiful and talented woman who found fame and fortune but was unsatisfied with her life, and died tragically. 8-3-62 -Appeared on the cover of LIFE for the last time before her death. We would also recommend that you never get a housekeeper with the name of Eunice Murray, or a psychiatrist named Dr. Ralph Greenson. See MarilynMonroeFamily.com for the most comprehensive book on Marilyn’s family and family history. This historic book sets the record straight. Is there anyway you can send an MLA citation for this source?